Today's theme is "The Amoeba Defense". The Amoeba defense was developed and used by coach Jerry Tarkanian (990-228 career coaching record) at UNLV some years ago. This is a gambling zone defense that will help you get some steals and fast breaks. 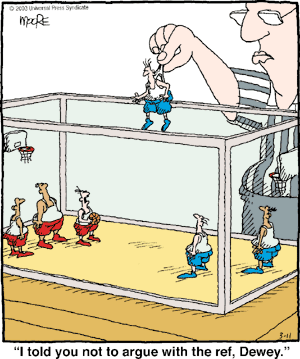 It probably would not be wise to structure your team's entire half-court defense based on the Amoeba. Rather, use it as something disruptive, that you can throw in at various times in a game to confuse the opponent, and force some turnovers. I believe that Coach Tarkanian played man-to-man defense, and the Amoeba. Initial Setup of the Amoeba (vs a One-Guard Front). See diagram A below. At the start, it looks like a diamond-and-1, with the X1 defender pressuring the ball as soon as it crosses half-court. A key point is to use your two quickest, best defensive athletes at the X1 and X2 positions. X1 pressures O1 (the ball-handler), making it difficult for O1 to either dribble or pass. X2 starts at the high post, denying a pass there. X3 and X4 start along the lane lines, just below the elbows, facing toward the sidelines. X5 is the "hoop defender". The hoop defender must never get beaten by a low cut (from behind), and his/her rule is to "get as low as the lowest offensive player". Pass to the Wing. See diagram B. O1 passes to O2. X2 immediately sprints over and closes out on the ball (O2). O1 drops to defend the high post (free-throw line). If O2 begins to dribble, X3 quickly sprints out and double-teams O2, along with X2. X5 slides over to front (deny) the ball-side post, and X4 drops inside to become the hoop defender. The defense now looks like diagram C. X1 and X4 look to intercept, or contain, any skip pass across the court. This is a difficult pass because of our trapping defenders with their arms up can sometimes tip the ball. If the ball is passed back out to O1, this is no problem, as O1 will probably not hurt us way out there. All defenders just rotate back to their original spots. If O2 has dribbled down toward the corner, a quick anticipating X1 defender might even be able to intercept the pass back out to O1. Pass to the Corner. See diagram D. The ball is passed to O4 in the corner. X5 will sprint and close out on O4 in the corner. X3 immediately drops inside to front the post. This is called a defensive "X-cut". O4 initially sees the low post O5 open (vacated by X5), and passes inside, not seeing X3 dropping inside. X3 can steal this pass and get the fast-break going. Additionally, when closing out on the corner, X5 should get the hands ready to deny that passing lane, and try to deflect the pass. X2 denies the pass back out to the wing. X1 and X4 have back-side and topside, skip-pass responsibility. Defending Skip Passes. Diagram E shows the skip-pass from the corner. X4 closes out on the ball O3. X3 slides across the lane to become the post defender. X5 drops inside and becomes the hoop defender. X2 covers the high post, and X1 gets into the passing lane to O1. Now X2 and X5 cover any skip-pass going back to the right side. Defending a Two-Guard Front - Triple-Teaming the High Post. See diagram F. Here, X1 and X2 match-up with the two guards. 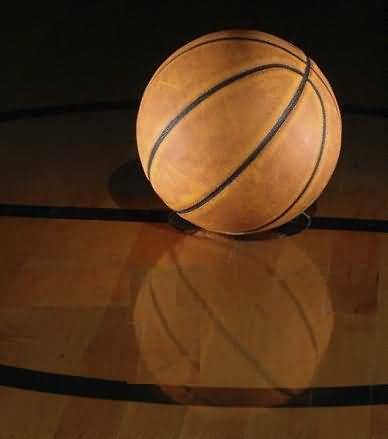 X3, X4 and X5 always use the same starting alignment when the ball comes across half-court. In this 2-guard set, X5 will usually play either at the high post or the ball-side low post (will not usually have to defend the corner). If the offense has someone (O4) at the high post, X5 slides up to defend, but will play behind and will not deny the pass. We actually want the ball to go into the high post. Once the pass is made to the high post, X1 and X2 clamp down and O4 is triple-teamed (diagram G). Hopefully, O4 will panic and either turn the ball over, or make a bad pass. Notice in diagram F, X3 and X4 are looking to steal a hasty pass to the corner. From the triple-team, the ball could be passed to either wing, or corner. If the ball is passed to the corner (diagram G), the defense immediately resets. X3 closes out on the ball in the corner, X5 drops and becomes the ball-side post defender, while X4 is the hoop defender. X1 defends the high post, and X2 denies the pass back out to the wing. X1 and X4 would again have skip-pass responsibility. If instead, the ball is passed from the triple-team to the wing O2 (diagram H), X2 closes out on the ball. X1 stays and denies the pass back to the high post. X3 denies the corner pass, X4 becomes the hoop defender, and X5 is the ball-side post defender. Notice that if the pass went to the left wing O1 instead, everything would be just the opposite, with X1 covering the ball and X2 denying the high post, X4 denying the corner, X5 is still the low post defender, and X3 becomes the hoop defender. Diagram I shows what could happen after diagram H, a skip-pass (in the two-guard offense) from the wing to the opposite corner. The rules are the same as described above under covering skip passes, except that in the two-guard set, X5 becomes the ball-side low post defender, and X3 is the hoop defender. X4 closes out on the corner, X2 covers the high post, and X1 denies the pass back out to O1. with Jerry Tarkanian, former Head Coach UNLV. Tark explains his Amoeba defense... (more info). See this video. Recently re-designed with a "new look"... take a look if you haven't been there lately!